This is my all-time favorite outfit. Faux real. Day, night, doesn't matter; I will wear it any time. I love each piece of the look so much, from my hat to my ankle boots. This outfit sums up my sense of style perfectly. 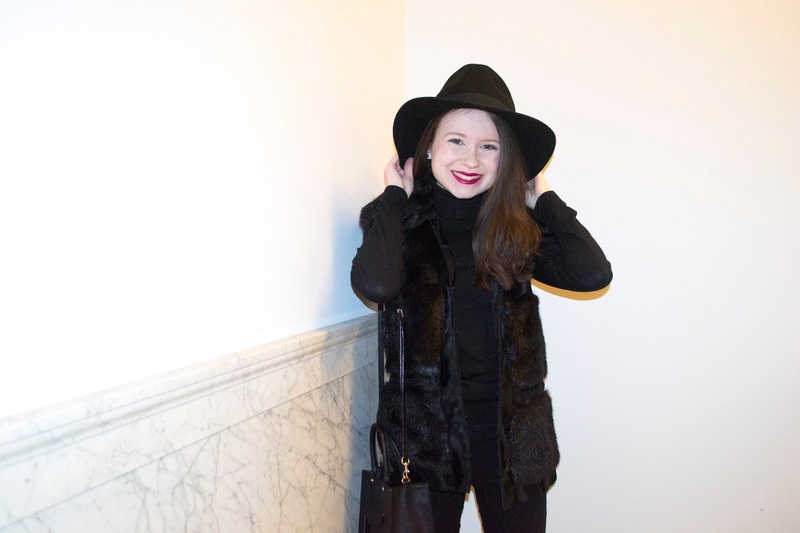 I love mixing classic pieces, like turtleneck sweaters and skinny jeans, with more trendy ones like a faux fur vest and wide brim fedora. Everything being black keeps the look sleek and cohesive. I added a pop of color by wearing MAC's 'Quelle Surprise' on my lips. I am so glad faux fur is in this year. I've always been a fan, but it's nice to get some style inspiration from other bloggers and celebrities who have embraced the fuzzy fabric. I really only wear this vest with my Topshop Petite Joni jeans, (which I highly recommend if you're short like me and looking for a pair of high waisted skinny jeans you'll want to wear everyday). I definitely want to branch out a bit and try the vest with a skirt or dress. It's the perfect layering piece, so why not take advantage of all the styling options? I'm going full faux and not looking back.